Oh my! This just might be my favourite thing I have ever baked (I’m sure I’ve said that before?!) 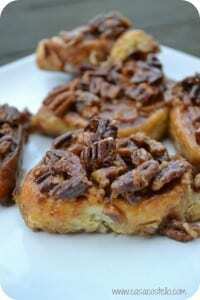 These Pecan & Maple Brioche Rolls aren’t necessarily the quickest bake ever but they are more than worth it. You do need to do the preparation a couple of nights before to get the brioche dough ready but please don’t be put off. I will admit to thinking on Monday night that these were a bit of a faff and surely they couldn’t be worth it, but they most definitely are! We were away on Tuesday night at a brilliant hotel (review coming very soon) so I used Monday to make a start on Bake of the Week. I first made Brioche dough about 4 years ago and they were a huge disaster. Since then, I have worked on perfecting my proving techniques (which I’m sure you are all heartily sick of hearing about) so back to Brioche dough it is! They worked perfectly – I can’t remember now what I used to find so hard about dough. Crunchy sticky pecan and maple syrup topped brioche dough balls - These are irresistible! You can freeze the dough before baking for up to 1 month. Put 150g of the flour into a large bowl and add 1 whisked egg, mixing through with a spatula. Add the yeast/milk mixture and continue to mix until all combined. Pour 100g of the flour on top and leave in a warm room for one hour. You will be amazed at what happens - The dough takes on a yellow colour with a white cracked crust - pure chemistry! After the chemistry has occurred, add the dough to a heavy duty mixer with a dough hook. A hand mixer just won't be up to the job. Add the sugar & salt to the mixer and start to mix on a medium setting. Whisk the remaining 4 eggs and continue to mix on medium. Add the remaining flour a tablespoon at a time, reduce the speed to slow when you are doing this. When all the flour is incorporated, increase the speed to medium and whisk for a solid 15 minutes. I stopped the mixer twice to clean down the sides with a spatula. Add a tablespoon of butter at a time whilst still mixing (reduce to a slow mix speed). The dough will start slapping about and look awful but keep mixing for 5-7 minutes and it will come together as a dough again. Once it is in a dough ball again, remove from the mixer and add to a large oiled bowl - Cover with oiled cling film and leave in a warm room for 2 hours. THEN ... refrigerate for at least one night and up to 3 nights! At this point you are saying, no chance - its not worth all that effort but bear with me! When you are ready to use, remove the dough from the fridge. Cut into 2 and roll out half on a heavily floured work surface until about 14 cm square. Mix the cinnamon and brown sugar together and sprinkle evenly over the buttered dough. No need to go completely to the edge on the from and back of the roll but do go to the edge at the sides. Roll up very tightly and double wrap in cling film and freeze for 30 minutes. Remove from the freezer and chop into even slices (about 1cm thickness) and place in a buttered oven dish and leave to prove for 2 hours. They will double in size and meet up. Preheat the oven to 180C. Melt the remaining 100g of butter and the brown sugar in a pan. Add the maple syrup and honey and boil for 1-2 minutes. Best eaten the same day and absolutely incredible eaten with cookie dough ice-cream! Remember, you still have half of the dough left over in the fridge - you WILL want to make another batch of pecan mix the next day! An absolutely incredible week for Bake of the Week – Thanks so much to everyone for getting involved! 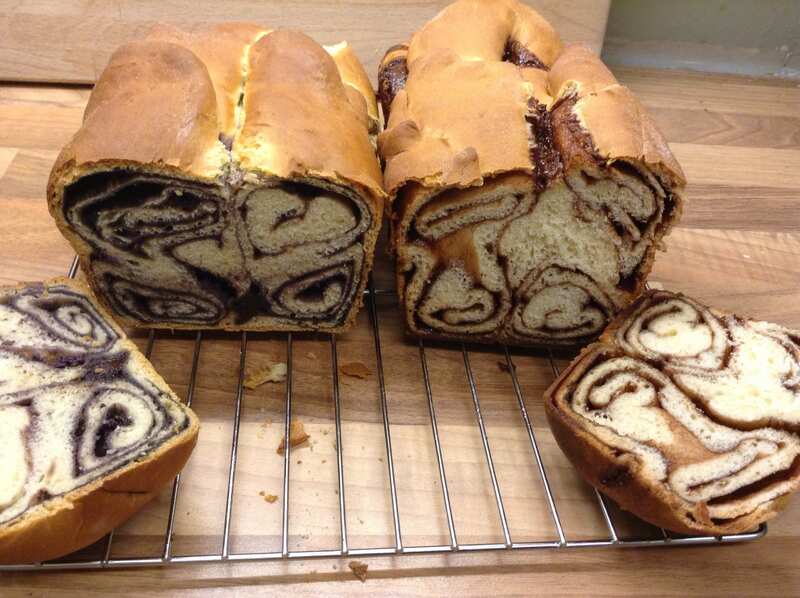 My featured Bake of the Week is Baking Queen 74 who quite by chance made Povitica. She had no idea that the GBBO were going to feature Povitica that week either! Lucy didn’t just stop at one Povitica (or Poviticas? Who knows what the plural is? ), she made 3 different types in one week! The woman is on a mission! They all look amazing, super job Lucy! 1. Debra from My Little Kitchen seems to love pavlova as much as I do – Who could resist the beautiful colours of this Mixed Berry Pavlova? 2. 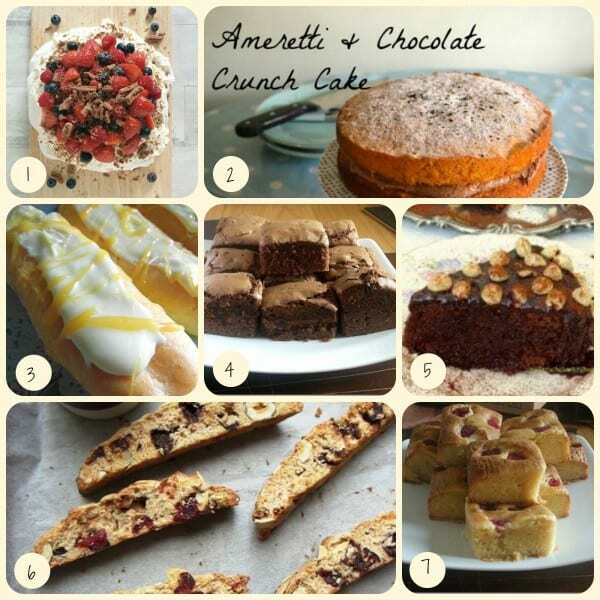 Ooh Amaretti & Chocolate Crunch Cake – I need a slice of this from The Foodie Couple Blog. I cannot believe anyone has leftover Amaretti biscuits waiting to be used! 3. 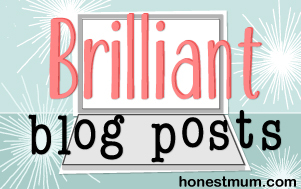 Emily’s Recipes and Reviews delights me with her White Chocolate & Salted Caramel Eclairs – Match made in Heaven? 5. I will admit to never having heard of a Gianduia cake but it looks delicious from My Little Italian Kitchen – Described as luxurious, nutty and elegant. 6. Patisserie Makes Perfect makes our mouth water again with these Hazelnut, Cranberry & Chocolate Biscotti. 7. White Chocolate & Raspberry Blondies – What a perfect combination of flavours. I bet these were really fresh tasting from Paul’s Food World. 8. Eileen from Et Speaks From Home is excelling herself recently with her beautiful bakes – This week she shares White Lotus Sandwich Cookies which are just stunning. 13. So light and fluffy, this American Sour Cream Cake from Food Jam has gone straight onto my To Bake List. 14. Since I made my Muesli Brandy Snaps, I’m really intrigued by using seeds in baking – ET Speaks From Home has done just the same with her Almond & Sunflower Seed Tuiles – Gorgeous! 16. Pretzels will always remind me of last year’s GBBO! These are just wonderful from Corina at Searching for Spice. The link is now open for next week’s bakes – The code for the badge to display is below. Well done on sharing the Bake of the Week love last week – We had our busiest week yet! Don’t forget all entries are commented on, Pinned, Tweeted and shared on Google+ – If you could visit one other entry that would be great and share #Bakeoftheweek but no pressure. For those people who also like to cook savoury items, you may be interested to know that from tomorrow (Friday) I am joining forces with Otilia from Romanian Mum in hosting Foodie Fridays. Tomorrow’s post will be all about celebrating everything savoury – Otilia will be doing the round up of all your entries next week. Oh yummmmm they are making me saliavte at 9am in the morning!!! 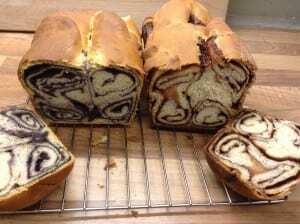 The Pecan and brioche looks so nice, they remind me a bit of Cinnabons. Its been so long since I’ve had those. Thanks for including my Biscotti in this helen. 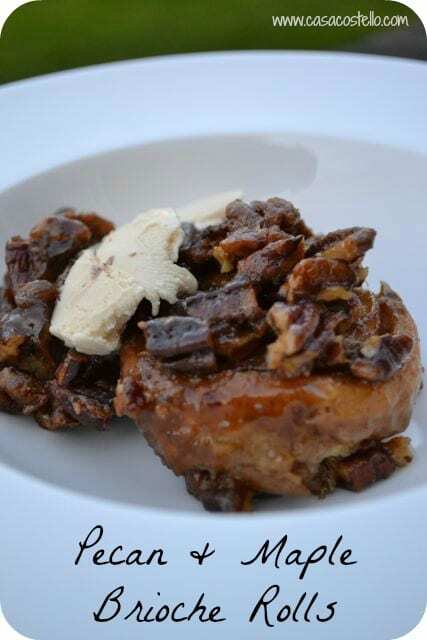 The recipes look great and maple and pecan is one of my favourite flavour combinations. 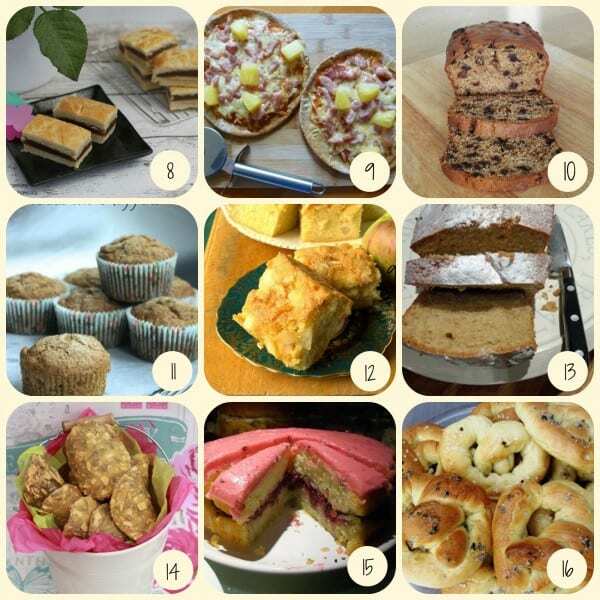 Lots of lovely bakes in this week’s roundup too which is great! Oh my, they look absolutely divine. I adore Brioche but have never tried to bake it myself. Warm with melted chocolate would go down a treat. I’m so hungry now! Your rolls look fabulous and so moreish! Brioche is so good. I could have this for breakfast! these look wonderful ! perfect for brunch. might have to try out for tomorrow. Still time to prep some dough! Looks very delicious! Will try them definitely!